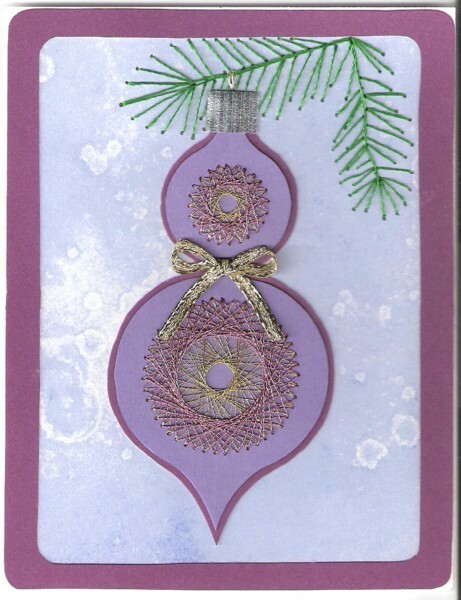 Cut out the ornament and mount it on dark purple cardstock. Cut around the ornament, leaving a 1/8" border. Add a 1/4" wide piece of silver curling ribbon to the top of the ornament. Cut the 4 1/4" x 5 1/2" background from blue scrapbook paper and glue it to the card blank. Cut the frame from dark purple scrapbook paper. For best results, stitch the branch before adding the frame (sorry, I stitched the branch free-hand, so I do not have a pattern). Position the ornament as desired and glue it to the front of the card.